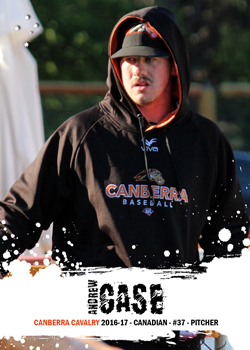 Case is a Canadian import from the Toronto Blue Jays organisation who played with the Canberra Cavalry during the 2016-17 ABL season. He had spent 2016 playing with the Lansing Lugnuts, the Blue Jays' affiliate in the single A level ball Midwest League. There was a bit of background to Case's shift to the Lugnuts, with the promotion coming about after he received a 50 game suspension for missing a drug test earlier in 2016. In 2017 he has rocketed up the ladder, playing Advanced A, Double and Triple A level ball.